So I'm one of those kids who grew up with The Pee-Wee Herman Show on television. I had no idea about the somewhat more adult orientation of the core character and all the comedy circuit drama that had come before it. It was just a fun and crazy show that really entertained me day in and day out after school. I totally tried some of the arts and craft stuff (potato stamps!) and I would go nuts when someone would say the secret word. This movie was one of the major stepping stones leading up to the children's TV show. It was beginning to find its voice in terms of younger audiences, but it still had a lot of tongue-in-cheek humor for older viewers as well. And while it wasn't quite as big a commercial success as people had hoped, it still helped build up brand awareness around the Pee-Wee Herman character and this helped things progress. I watched this movie again given a recent wave of Pee-Wee nostalgia, and I was pretty surprised at the quirky cameos in this movie along with a lot of the stranger elements of humor that the creators got away with. 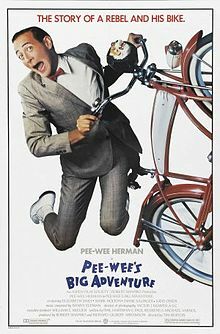 Synopsis: Pee-Wee's Big Adventure was the first movie created based on The Pee-Wee Herman show that had been touring the comedy circuit. It was the first feature film of director Tim Burton with a screenplay by Paul Reubens, Phil Hartman, and Michael Varhol. At the center movie is the titular character of Pee-Wee Herman (Paul Reubens), who can best be described as a man with the mind of a young boy. And this man-child loves his special bicycle more than anything in the world - even when the spoiled rich neighbor kid Francis (Mark Holton) tries to buy it from him. And despite his best efforts to keep the bike safe from all possible harm, it eventually does get stolen while he's in town to visit Dottie (Elizabeth Daly), his big time crush who works at the bike shop. Pee-Wee then consults a supposed psychic in order to get help in finding his missing bike, which kicks off his big adventure. Following scammy advice, Pee-Wee pretty much engages on a cross-country trip all in search of hi special red bicycle. It's an adventure that involves a train, dinosaurs, a movie studio, and a jealous boyfriend! It seems like a lot just for a bicycle, but you really need to understand just how much he loves it and how far he's willing to go. The movie feels a lot like the kind of tall tale that only a kid could come up with. It flows like some crazy steam-of-consciousness narrative, which is just as well since each major moment is pretty much a sketch comedy routine. Thus you can take the little scenes one-by-one and enjoy those snippets for what they're worth without getting too deep into the overall story. You can still try to look at the "bigger picture" as it were, but admittedly it's a rather shallow tale on that level. The movie is more of a series of experiences - some that are funny, some that will get your kids shouting and others that just fall flat. That is why the movie worked and yet also what held it back. I don't think they were too clear yet on whether or not they wanted to embrace a purely younger audience or the reverse. It was a bit of a surprise to me that Tim Burton was the man behind giving this movie its vision and direction. And while it's certainly not like his more recent projects, you can sort of see what will later become his more signature movie style. There are certainly those oddball moments, the starkly bright splashes of color and the scenes that touch on something in the child in all of us. Pee-Wee's Big Adventure is a bit of a cult classic, and I can understand why it never became more than that. This is not quite mainstream entertainment and not quite ready for children alone - but there's actually one more movie that tries to work on that before the big TV show happens. The movie rates a good 3 crazy casting choices in the supposed movie made within this movie based on his fictional exploits out of a possible 5.